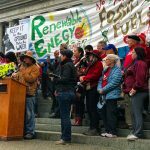 Over 300 people from around Washington state, including tribal members, descended on the State Capitol in Olympia this week, to instigate a campaign called “Climate Countdown”. They say time is running out to pass groundbreaking climate legislation and are demanding the legislature take meaningful action in the 2018 session. Martha Baskin brings us the story.